The Lindell Building, formerly located on the southwest corner of Eighth Street and Washington Avenue, was constructed on the site of the Lionberger Building which was destroyed by fire in March, 1897. The Globe Democrat reported on 18 April 1897 that the heirs of John Lionberger intended to rebuild on the site of the Lionberger Building. The Globe Democrat reported on 1 May 1897 that the heirs had transferred the property to the Washington Building Co. 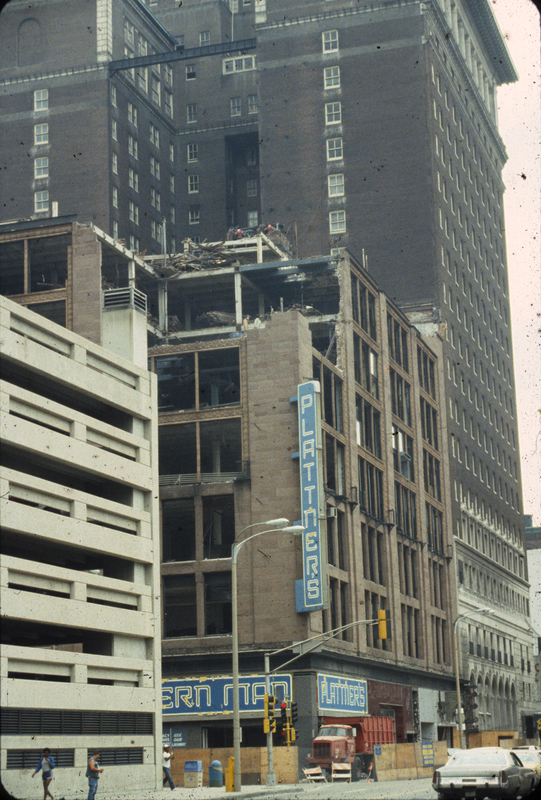 This company had been organized by them to rebuild the Lionberger Building (also known at the time as the Ely-Walker Building). Articles of Association for the Washington Building Company indicate a capital stock of 400,000 dollars; 4000 shares with a par value of 100 dollars. Six members of the Lionberger family by birth or marriage held all the stock in the company. Also in April of 1897 the Brickbuilder carried notice of the intention to rebuild the Lionberger Building. Transfer of the parcel took place on April 29, 1897. A building permit was issued prior to this, on April 16, to John D. Davis, a principal of the Washington Building Company, for an eight-story brick structure costing 200,000 dollars. The original Lionberger Building permit indicates a cost for the prior building begun in 1887 of 250,000 dollars. In May of 1910 the parcel was transferred from the Washington Building Company to the Lindell Real Estate Company. At this time renovation work of the then-existing structure amounting to over 220,000 dollars was carried out. This appears to have been part of an expansion and consolidation of the entire block between 8th and 9th Streets for purposes of developing the whole as the largest retail space in the city. Records indicate that subsequent modifications and alterations of the property were made in 1915, 1918, 1919, and 1920 for a total cost of 117,000 dollars. Unfortunately, there still remains some doubt as to who designed the Lindell Building. It has traditionally been attributed to Mauran, Russell, and Garden, but the evidence strongly suggests that it was the work of Shepley, Rutan, and Coolidge. 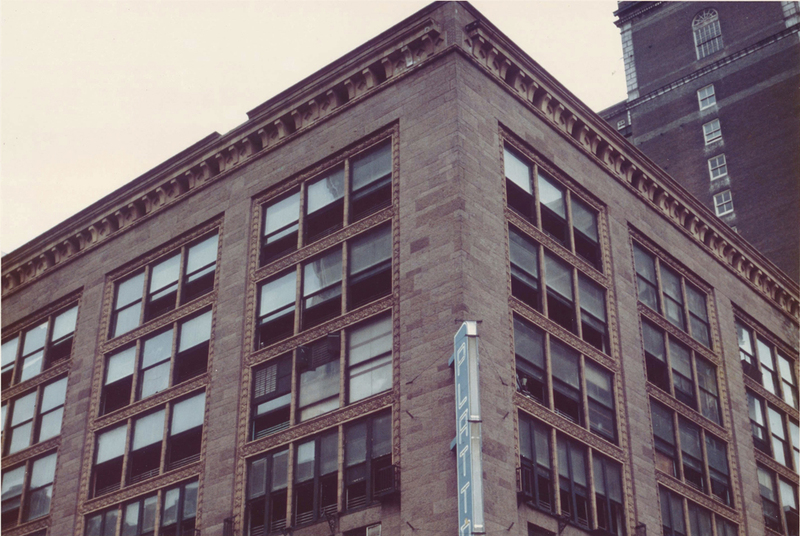 The original Lionberger Building was a design of Shepley , Rutan, and Coolidge, the successor firm to H.H. Richardson. Among the other commissions received by the new firm just after the death of Richardson were the Bell Telephone Building, the Newcomb Building, and several homes on Vandeventer Place. Part of the firm’s success in St. Louis derived from its connections with the city through birth and marriage. George Forster Shepley (1859-1903) was an 1880 graduate of Washington University who had done advanced study at M.I.T. before joining Richardson’s firm. Just after the fire which destroyed the Lionberger Building, the Globe Democrat of April 18, 1897 indicated that it was the intention of the owners to rebuild using the old walls up to the fourth story. The Brickbuilder of April 1897 named Shepley, Rutan, and Coolidge as the architects for the rebuilding and claimed that it was their intention to reproduce the original building as nearly as possible. It is impossible, at the present time, to determine when construction on the new building began. It is clear, however, that the Lindell Building was not, as originally intended, constructed as a copy of the Lionberger Building. Its style is that of Shepley, Rutan, and Coolidge’s other major commercial buildings of the late 1890s in St. Louis and similar to that of Mauran, Russell, and Garden’s work after the turn of the century. Assuming that construction of the Lindell Building began shortly after building permits were issued, it would clearly have to be the work of Shepley, Rutan, and Coolidge. The firm of Mauran, Russell, and Garden, all of whom had been employed by Shepley, Rutan, and Coolidge, was not organized until well after the probable start of construction on the Lindell Building. It is equally clear, however, that Mauran, Russell, and Garden were responsible for the extensive alterations and renovation work done on the building in 1910 and after. Just after the Civil War, in a period of rapid expansion and commercial development, Washington Avenue became the site of wholesale and retail trade in St. Louis. In part this was the result of the completion of the Eads Bridge in 1874, a major rail, carriage, and pedestrian connection across the Mississippi River which terminated at the foot of Washington Avenue. At first new wholesale and retail businesses confined their new construction to the intersection of Broadway and Washington. However, during the 1880s development continued up Washington as far as 8th and 9th Streets. By the end of this period of expansion major wholesale houses such as Rice and Stix had built as far west as 10th Street. The original Lionberger Building was a major component of this westward development of Washington Avenue. By 1900 wholesale houses had been constructed as far west as 12th Street. The Lindell Building was, at the time, part of this larger pattern of wholesale expansion and development above Broadway on Washington. After the turn of the century, however, wholesaling began to locate much further west on Washington. New construction was centered above 15th Street. 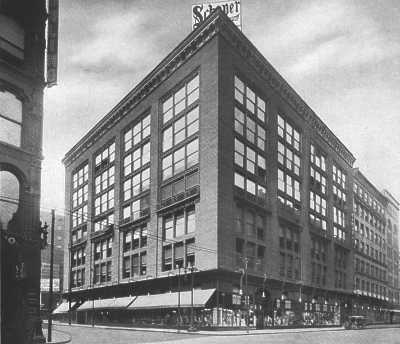 The conversion of the Lindell Building into a major retail space in 1910 was therefore met with great enthusiasm at the time in the local press. It signaled the emergence of the section of Washington Avenue east of 12th Street to Broadway as the city’s major retail district and clearly dispelled fears that the flight of wholesaling to locations further west would doom lower Washington Avenue to decline. The Globe Democrat of May 29, 1910 excitedly reported the pending redevelopment of the site, while subsequent reports in the Republican on June 3 and 5 provide further details of the renovations . From these reports we learn that the Schaper Brothers Mercantile Company intended to occupy the building and convert it into a major department store. The building was to be completely remodeled inside and out. Included in the plans were the installation of plate glass show windows at street level, electric elevators and other up-to-date appointments for the interior. According to the Republican, Schaper Brothers would become the only dry goods house in the city to occupy a full city block; its location would have eight floors with each covering some 30,000 square feet for a total under one roof of about seven acres. Today only the Stix-Baer-Fuller Store remains on Washington Avenue to give testimony to the importance which this area formerly enjoyed as a retail center in the city. The original Lionberger Building, begun in 1887, was directly related in style and character to H.H. Richardson’s Marshall Fields Building of 1886. By 1897 the style of Shepley, Rutan, and Coolidge had clearly moved away from that of the Richardsonian Romanesque and was increasingly following the lead of Mckim, Mead, and White, in resurrecting the major elements of Italianate Neoclassicism, otherwise known as Renaissance Revival. Several of the firm’s other buildings in St. Louis at this time, also on Washington Avenue, clearly exhibit this tendency. Like them, the Lindell Building, however, also reveals an influence of the late Chicago Style which itself reflects the inspiration of the Prairie School. In particular, the Lindell Building, in its restraint, clean lines, Chicago style windows, and ornamental detailing, is close in spirit to the work of Schmidt and Garden in Chicago after 1900. Indeed, the Lindell Building must be regarded as one of the finest examples of this style done in St. Louis at the turn of the century. As one of the last remaining works of Shepley, Rutan, and Coolidge in the central business district, its loss is a major tragedy. Text by Lawrence Lowic, 1982.